The confession and wait might happen this episode! If it does then you know they will make us wait for the answer until the very last minute. It’s cool, I can wait. Mirae walks off, but KS says her name so she turns back around. He walks up to her. KS – What if…something like this happens to you again. I am going to get involved even if I do not use my fist. Is that okay with you? MR – If you talk like that, then I will mistake it. MR – Like me…you are….nothing. Just go, I will leave. She starts to walk away but he grabs her arm to stop her. KS – Don’t you…like me, at least a little bit. they look at each other for a moment, but then she pulls her hand away. MR – No….not like that…if you mistook it and it made you mad, don’t worry, I never had any feelings, you are just friends to me okay? 100%. KS – You…do you have another guy that you like? MR – No, I don’t. She hits him on the arm playfully and tells him that she will see him tomorrow. Then she hurries off. He watches her leave, but is too filled with emotions not to let it show, so he rubs the back of his head as he thinks. MR gets to her room and thinks about what he said. Don’t you like me at least a little bit? But she tells herself not to think about it, I alraedy gave it up, it will not work with Kyung-seok. Do you want to ruin your life again? At the same time, Kyung-seok walks home thinking about all this as well. He gets home in a funk which makes Woo-young ask if something happened since he does not look happy. KS goes to get drinks but WY says something about how he should clean or something. KS tells him that he will give him more rent so they can do their air share of chores. Then he goes to his room. WY is steady wondering what is going on. KS goes to the bathroom and thinks about being placed in Friend zone. TITLE: YOU – YOU DON’T LIKE ME? (OR DON’T YOU LIKE ME). MR wonders what she should do when KS shows up. How should she act. Today is a special class with Hye-sung that Woo-young prepared. Umma is pretty nervous to give her class. Woo-young is all like, are you going to sing? She asks, do I have to sing? WY says these kids now expect it (but he might be joking). Finally they arrive in the classroom. Umma is applauded by all the students. They all think that she is so pretty, this must be the reason why Kyung-seok is so handsome. ALl the students talk about this in their own way. WY introduces Na Hye-sung and everyone claps again, but Jung-boon notices that Kyung-seok is not there. That is pretty weird. MR looks around and does not see him. Kyung-sok is at a salon. Everyone is fawning over him and one of the salon stylists accidentally cuts like 5 inches of hair off of her client. She tries to not let on, lol. In the class, Hye-sung talks about how you remember smell more than anything. Food smell reminds you of your mother and perfume smell reminds you of your status when you were young. But then KS walks in with grey hair. Everyone is all like, um…what is that? His mother tries not to lose her composure at her sons new look. She continues talking and tells them that she is not sure what image they will have of her but she hopes they will apply for an internship, she will finish her lesson there. After class, umma tries not to comment on her sons hair as she talks to him. What are you doing for vacation? Will you apply for an internship? he says he will think about it and walks off. Umma wonders if he is going through puberty again. MR walks off wondering what is wrong with KS as well. Women usually change their hair when they get dumped, maybe this is something to do with that. But then she bumps right into him. They are awkward as she tells him he looks cool but he says he did not do it to look cool – you look pretty,…I did not do it to look pretty…. – Okay, have a good exam. But it is not exam time so MR walks off wondering why she told him that stuff about the exam. Meanwhile, the upper classmen talk about KS’s hair. Tae-hee wonders if Yena still likes KS. Yena says not that much anymore but he is still in her heart, everyone has that kind of looking person in their heart right? Cut to Hye-sung taking her daughter out for a meal. She apologizes for cooking her horrible food. But her daughter says her food was good. Umma asks her daughter why KS would change his hair, the daughter thinks it might be girl related, maybe he was dumped. Kyung-seok gets home and WY is as shocked by his hair as everyone else. They playfully argue for a moment, but then WY realizes that KS must be a model for that hair salon. KS is all like, how did you know? Don’t pretend like you know me that much. WY pretends like he is about to hit him. Cut to MR and KS in the library studying. MR thinks the he changed his hair back to normal. She looks up at him as he is reading. But then she tries to concentrate. He looks up at her as she is studying. Then she looks back up at him, but he is not there anymore. She looks around to see if he just left, but then she just sighs and looks at her table. Finals finally ends, we know this because Sung-woon screams this at the top of his lungs when he leaves the building. Everyone wants to go far away from the school now that finals is over. MR takes a call from someone and happily walks off to meet them. Tae-hee comes out with Tae-young as well but is then walked up to by CW. He is his regular annoying self. When he leaves, Tae-hee asks Tae-young what he is doing, that guy told her that she is fat, what are you doing (talking to him). She walks off, very upset. Elsewhere on campus, SA feeds her little cat and apologizes for not taking care of her during exam time. But then she sees another student on the sidewalk. This kid likes her and goes to a PC bang to ask all his internet friends if they think she likes him because the cat has his name(?) and she talked to him and all those things. Meanwhile, MR goes to talk to Hye-sung and have a meal with him. Hye-sung wonders why KS changed his hair when he normally does not care how he looks (her daughter told her). She does not want to be a nosy mother, but maybe MR knows? Are there any problems? MR is a little embarrassed so Hye-sung apologizes for that. In the school, SA applies for the internship with WY. KS also goes in to apply for the internship and completely ignores SA. She walks off. WY and KS have their usual bickering relationship. WY asks if he is angry at him but KS just leaves. WY is left confused once again. Back at lunch, MR tells umma that her son is too much for her and too handsome. But Umma says that they like each other so what is the problem? MR says that a very pretty girl likes him and everyone says that they are a good match, but she is worried about what people will say if a girl like her with plastic surgery dates him. That is what happened. Hye-sung tells her that a lot of women are the same, seh is angry at people that made her think that way, she does not know the details so she cannot say, but that pretty girl is the same as you. I hope you do not regret this. Then she asks, Did you apply for the internship? MR is stunned as if she did not apply, but MR happily tells her that they should eat. Later on, MR walks home and runs into WY. They go to talk where he tells her that she did not apply for the internship. MR says that she will go home during that time. But WY says that this will be a good experience for her to confirm her field and sense of smell, it might be the last opportunity. MR asks if she can apply for it now. WY says of course, he will put her in the list right away. She thanks him so much. He says if she is thankful then maybe they can watch a movie this weekend? MR says she can call HJ, but he tells her that it can be just the two of them, he wants to tell her something as well. At SA’s house, she measures how much she weighs. She must have gained too much weight, because she pulls out some diet pills. She goes to work (or the internship) and runs into the kid that likes her. He bashfully and very shyly tells her that tuna has too much salt so it might not be good for cats, you should wash it first. Then he hurries off. All the students show up for the internship. MR sits next to SA where she is filled in on how they quit their part time jobs. SA says hi to MR but he ignores her again. The people who work for he company show up and give their introductions. They will hear everything about perfume as an intern so ask all your questions to this person. back at school, Yoon-byul goes into Woo-young’s office and says that she has something to tell him. She does not speak too well so she wrote it down. She gives him the letter and leaves. Sunbae, I am Kwon Yoon-byul. Woo-young stands up and with a sigh, wonders what he should do about this. Back at the internship opportunity, everyone has to find a combination of perfumes. It is very difficult for everyone becuase the perfumes all start to smell the same, but MR is able to figure it out. The woman says that she is great, she is the one that made the candle also right? Wonderful. SA watches this with jealousy and thinks. Outside, WY is speechless at what he has to do with this girl that likes him at school. He is walking with Hyun-jung but he is all in his own thoughts. She tries to pull him out of them and bashfully asks if he might like to eat dinner with her. Something nearby? he agrees. At the same time, all the students show up to the bar. they wonder why WJ is still there, it is because he is a part-timer now. KS shows up but sits at the bar with his friend. WJ asks him why he is sitting alone. They playfully talk back and forth about being wang-tae. But all the other kids tell Kyung-seok to come over there to them. WY tells him to go, stop isolating yourself again. At lunch with Hyun-jung, Woo-young is still completely out of it as he thinks about this problem HJ asks him what he is thinking about. he tells her that someone confessed that they like him. HJ tells him that he is popular, what are you going to do. He says that he is thinking about how to refuse it. It does not change his heart even though she likes him. HJ tells him that he has a definite personality, he says that is true, he has his own taste. HJ tells him not to be too harsh when he refuses her. Some people think that you should be harsh, but if that person is a good person, then you should politely refuse it. I didn’t experience it but… He tells her that she picked a good major, psychology. At the bar, the girls start to talk about entertainers. They as SA what entertainers she likes. The kid that likes SA listens intently. She says she doesn’t like entertainers, she likes guys thta like her. They ask MR, do you like cold chic guys or dandy guys (a cartoon of each shows up). She says that she just likes normal guys. KS tells them all that he is leaving first. All the girls wonder how he can be so chic and draw their attention even more. MR watches kS leave with concern. KS goes outside and then goes to a convenience store. He grabs an umbrella and thinks about MR asking him to take her umbrella with him since it might rain. he happily took it. In the conveinece store, he buys two. he heads back with two umbrellas and sees SA. She happily asks if it is for Mirae. he tells her to stop all her meaningless BS. But she says that she is trying hard to get to know him. He tells her that he does not like her and if she was truthful then she would not do this. She runs and hugs him. Then asks if he still has no feelings. MR walks out right at tht moment and runs in the other direction. KS pushes SA away and grabs his umbrella to go after her. But SA grabs him and asks if he has no feeling at all? he just looks at her and tells her that she is really a sick person. he leaves and SA is left thinking about that. KS walks in the direction MR left and pulls out his phone to call her. Mirae is walking away in the rain, but stops as she thinks about all her feelings. hey all crash in on her at that moment so she holds her chest and tries to breath through it. But then KS holds the umbrella over her head, all the rain stops falling on her. Did it make you mad? I told you that I don’t care about her. MR pushes the umbrella over his a little bit and tells him that he is getting wet. he pulls her a little bit closer and tells her not to sway the conversation, do you really not know? I like you. Let’s date. Don’t avoid me this time, answer me. MR – Why…why would someone like you like someone like me? KS – What is someone like me and someone like you? KS – So what? So waht do you think? KS – What do yo think about me? MR – I think you and me don’t work. I told you that before. You were cool to live my way, but not me. I wS MOCKED a lot for being ugly and people call me Gangnam Beuty. KS – SO what do you think about me! MR – It is important what people say. Do you think I am a girl that only thinks about looks? You will never understand how hard my life was. If I date you then it makes my life so hard. KS – So from the begining, I was not working? They stand in the rain as they both take that in for a moment. But then he leaves the umbrella in her hands and turns to walk off. he slowly, very slowly, walks around the corner. She also turns to walk away. While walking, she tears up. VO – So, it finally ended like this. She breaks down and cries int he middle of the sidewalk. the rain is still pelting her as she stays under the umbrella. KS is walking in the rain with the umbrella in his hand, but it is not open. He is lost in his thoughts, but then he turns around suddenly and looks down the street. But he thinks better of it and continues walking home. The kid that talks to SA is getting even crazier. he gives SA a drink and the politely takes it. So the guy goes back to the PC bang and tells his internet people that he did not know he could get a girlfriend this easily. The friend thinks this guy is crazy. Meanwhile, MR and KS run into each other int he hallway. It is very awkward in an uncomfortable way. he asks her if he can talk to her for a moment. They go to the windows to talk. She asks if he ate and he says something about how he should not do that (or something). He tells her that he can’t go back to the way it was before….but – he will wait for her. He leaves to go to class. Cut to her parents driving together. Umma looks pretty so she keeps looking at herself int he mirror. her husband tells her to stop looking at herself, she is pretty. They playfully talk about when they used to date, he told her she was pretty all the time and followed her around. They think they should go to sunbaes place, it will be hard for appa to carry two watermelons. He says it is okay, he can’t ask his pretty wife to do it. She asks if she is the pretty mother of a Gangnam Beauty, he happily tells her yes yes yes, you are! They both laugh. They get to Woo-young’s house and run into Hye-sung and her daughter. Hye-sung finds out that they are MR’s parents. They happily laugh and then go eat. They all talk about how Mirae is a good girl and smart. Appa talks about how she can dance well also. MR’s mother tells Hye-sung that she is so pretty, just like a gannam Beauty. Hye-sung is all like huh? 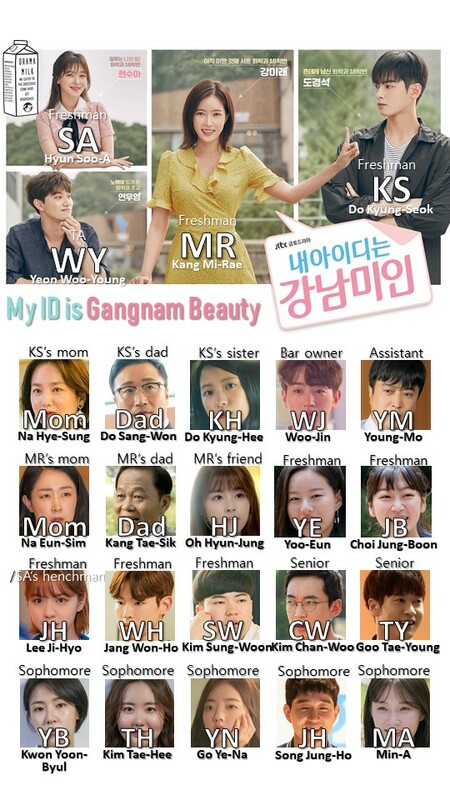 The daughter fill them in and tells them that her mother did not get plastic surgery, Gangnam beauty is only for plastic surgery people. Umma and Appa drive home bummed. The song they listen to is “I want to cry” as they drive home (it is kind of playful though). All the interns are together. Tae-hee gets a text from TY, he wants to talk to her privately. SA watches. Outside, MR waits for the bus and KS walks on by. They don’t talk to each other. But then she gets a call from her sunbae. he asks her if she is done? Would you like to meet up and eat something delicious? She actually forgot about it and hops on the bus. KS looks back for a moment, but then continues on. MR and WY get to the restaurant together and eat. MR talks about how the movie was really good, the dancing part was so funny. He asks her if she would like to drink something? She says that she can’t drink, you know that. He confesses that he is actually weaker than her, he can only drink two cups. He talks about other thinks he does not know about him, I do not like samgyupsal, I like to study, and I like you. Did you really not know? She asks him why he likes her, he smiles and says it is because she is pretty. Cut to the bar, KS is brooding with his beer as his friend tries to figure out what his worries are. it is women right? it is, I know it. KS says that someone told him that seh can’t date him not that she does not want to. WJ asks if she is pretty. he says that seh is not pretty or ugly, she is just how she is. In the restaurant, MR asks if the only way he likes her is because she is pretty? I did not know that you are like that. he says that she is his style and of course he likes pretty people, everyone likes their own type. But she tells him that she was super ugly before, you can’t even imagine it. Why do you like someone like me? he asks, someone like you? Because you deserve it. I like you because you are pretty, but I also like you more and more as a person. Cut to Kyungs-eok living in his dumpness. He thinks, to me…you are just you. MR and WY walk home. He thinks it is awkward that he confessed to her and they walk together. But then he sends her on her way to her place with a few stutters. She walks off. While walking, she thinks about her situation and turns back. She pauses a moment and then runs back to WY. WY – Mirae? Tell me, slowly. MR – You told me that I can think about it but, I am…sorry. WY – …okay, I know what you mean. MR – I am sorry. WY – It is okay, I was already prepared for it. WY – You don’t have to be sorry. MR – I don’t know if I can do it, I am no one. WY – Don’t do that again, there is no one that you should love or should not love. Being attracted to someone is something you cannot control. I hope it goes well with Kyung-seok. I knew that you guys liked each other. But I at least wanted to tell you how I felt. Kyung-sok is a good guy, he is handsome. MR – No, you are also handsome, but it is not because of that. You are a good person too. WY – i am okay, don’t cry…..you follow your heart, don’t cry. Kyung-seok walks up on this moment as he sees WY patting MR on the shoulder. He is about to explode. No preview? It looks like there might not be a preview released yet. I love how this episode ended. They went back and forth between people confessing, wanting to confess, and also getting dumped. But not just with t he main storyline, they tied the side characters into the main storyline as well as it appeared that everyone either got dumped or did the dumping this episode. I also love how Mirae is struggling with thinking that she does not belong with anyone since she had plastic surgery and yet everyone is telling her that she does. Only one person told her she didn’t (SA) but three people told her she does. However, she believes that one person, because that is actually what she, Mirae, believes herself. Hopefully she can change that belief system soon. oh god !!!! this is getting on my nerves, i luvvh this drama but seriously they are dragging a little bit now! thanks for recapping it so fast. You are the best! They are leaving trench marks with how much they are dragging this out! I knew this would happen. Since they will follow the webtoon this does happen in that as well. Not the last scene tho 😂😂 expecting next episode to be dramatical and they will be together in it. If it does not drag out and follow the webtoon. Thats how it was in the manga. They only had one kiss in the manga as well and the second lead wasn’t in it as much. hi, thanks so much for this! i think im the one about to explode after that ending! why not end on a happier note?? late episode was a hard watch for me already. I cant with KS sad face. Its already episode 12 for heaven’s sake! Plus I want SA exposed for the witch that she is asap! And MR, if it was me id be willing to suffer if i can just have that one guy who loves me the way i am regardless of packaging. I want to shake her so bad argh! Again, you are a goddess thanks so much. The webtoon had very few things going on other than dragging the OTP’s story with full-on flashbacks. I was pretty much skipping chapters by the end. So, thankfully the screenwriter put in the subplots in the drama. In the meantime, I really like WY, he is the most realistic character here in terms of relationship expectations. Level-headed without any backhanded techniques…a worthy SLS!